Ask our caring staff about euthanasia procedures, burial and cremations when the time comes for your furry family member, we can help you through this process. The death of a pet can be very distressing. Our pets are not only members of the family, they are our faithfull friends, our children's devoted playmates and reliable, affectionate companions for the elderly or disables. They enrich our day-to-day lives and their passing makes for a deeply felt loss. Losing a friend, and that is what your pet is, is always very painful. Facing such a loss is not easy, and may evoke feelings of denial, anger, guilt, or depression before acceptance is reached. These reactions are entirely natural and should be expressed. Everyone grieves in his or her own way. You may experience some or all of these feelings, in varying degrees and for different lengths of time. Acknowledging them is an important step in the mourning process, one that will help you understand why you may have withdrawn from, or lashed out at, people who care about you. You should realize that it is perfectly natural to need comforting. It will not only help you cope with your emotions and adjust to life without your pet, but may allow you, in the future, to provide welcome support to others around you who are experiencing the same loss. Be honest. Children are very intuitive and know when something is wrong. In wanting to safeguard them from a painful experience, you may feel it's wiser to exclude them from the decision-making process. Once the decision is made, talk openly about what has happened. Provide your children with honest, simple answers that are appropriate for their age group, using terms they know and understand. Not only will they respect you for your honesty, but they will also be better prepared to deal with the situation. Avoid euphemisms. Your children can be confused by phrases like "went to sleep." Indeed, employing such terms may lead to fear and cause some children to become anxious about actually going to sleep. Encourage children to speak freely about their pet's death and give them the opportunity to vent their grief and sadness. Share some of your own feelings and involve them in the pet's funeral preparations, if any. This will help them deal with their concerns and give them the chance to say goodbye in their own way. Make sure that children understand that no one is to blame for the pet's death. Such an occurrence may arouse their curiosity about death and its consequences in general. 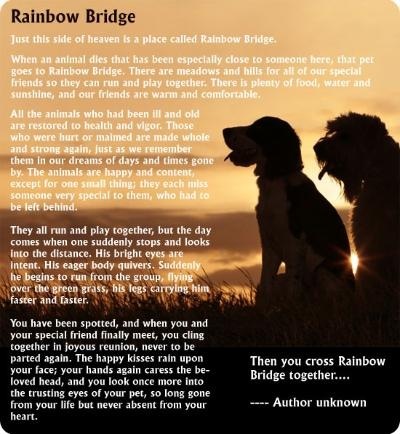 A factual, straightforward approach, using answers or illustrations that are appropriate for their age group, will help guide children through the grieving process and lead to their acceptance of the pet's death, without pangs of unnecessary guilt. Even though we may not believe it at the time, the old adage "time heals" does hold true when we are faced with the loss of a beloved pet. Recognize that loss and give yourself the emotional time and space to grieve. Getting over the sorrow, guilt and pain varies from person to person. Seek help. Many hotlines, chat rooms, message boards and support groups are available on the internet, and books on adult and child bereavement may help you better understand what you are experiencing. And, if you need to, don't hesitate to reach out for others' personal and professional assistance. Talk to your veterinarian, trusted friends, or a therapist. Make a donation or volunteer your services to a pet shelter or Humane Society. With time, the pain will lessen and you and your family will be able to fully cherish happy memories of your special friend.